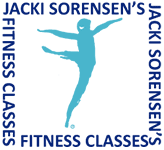 Jacki Sorensen created the world’s first aerobic dancing program more than 40 years ago, and Jacki Sorensen’s Fitness Classes continue to be at the forefront of fun fitness for all ages. Her Get-It-All-Together approach offers everything you need for a complete head-to-toe workout with maximum results. You will enjoy moving to a variety of motivating music and feel great about all you have accomplished at the finish of every class!